Growing up, Umoja was the Kwanzaa principle that meant the most to me, probably because it was the one that was most widely praised or even mentioned. Since it was the first principle, I used to think it was the most important one. As I have gotten older, Nia has become most reflective of where I am on this journey of life. Defining my individual purpose has been something I have been striving to do in the last 3-4 years. I think my purpose became clearer when I embarked on my journey as a food blogger. Clarity randomly arrived when I stopped fighting a part of me which was so rich with tradition that it excited me unlike anything else but it also ironically filled me with deep calm and still. From the moments I learned cooking and baking from my Big Mama, mama and aunt, I always felt that sense of calm in the kitchen. It always felt just like home. Recognizing that there was more to that calm than just sustenance was a great deal difficult. It wasn’t because I lacked the ability to truly see within, it was more or less because I thought purpose was more challenging to find. Who knew it was staring me right in the face. I have since realized that even though sometimes our paths can zigzag and go down long winding avenues, we can sometimes land right back to our roots where we first started. From the moments I learned cooking and baking from my Big Mama, mama and aunt, I always felt that sense of calm in the kitchen. Home has always been comfort food for me, especially cornbread. Cornbread was an essential component of all meals in my family. I could expect either a skillet or a hearty basket of muffins ready for consumption on the dining room table each night. While my mom always depended on her favorite recipe, I have played around with several renditions that bend and reshape according to my moods. This cornbread is perfect for the season. The beauty of the sweet potato is the perfect compliment to the hint of maple and rum found in the batter. The flavors don’t overpower the sweet potato but it is enough for you to taste the subtitles within. Since I found my purpose in this field, I have realized that my creativity and fearlessness has helped me remix the very recipes I experienced growing up cherishing. It is something that I am truly grateful for especially during this time of year. Now, I can celebrate Nia in all of its wonder. In a large bowl, whisk together all-purpose flour, corn meal, baking powder, sugar and cinnamon until well mixed. In a separate medium sized bowl, whisk together buttermilk, melted butter, mashed sweet potato, eggs, maple syrup, rum, vanilla extract, and oil. Slowly add wet ingredients to dry ingredients and mix together until well combined. Let the batter sit for 10 minutes. Coat muffin pan with shortening or prepare with non-stick baking spray until fully covered. Add cornbread mixture to muffin pan 2/3s full. Place in oven for 16-19 minutes until cornbread is done. Remove from oven and serve. I love this post!! and I’ve learned some things about Kwanzaa principles. . unity and purpose. This is beautiful and I love seeing and reading about people finding their calling in life, their sense of calm and peace and love that Jocelyn found hers in the kitchen!! 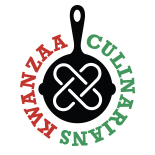 This entry was posted on December 19, 2014 by Kwanzaa Culinarians in Nia, Personal Story, Recipe, Umoja and tagged bread, cornbread, Grandbaby Cakes, Jocelyn Delk Adams, Maple Rum Sweet Potato Cornbread Muffins.